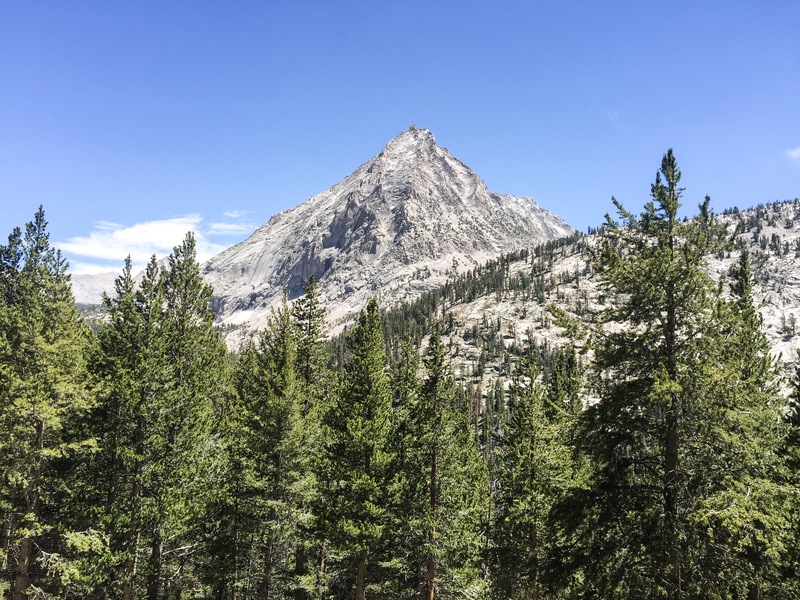 The highest point on the PCT is Forester Pass at 13,200ft, and it was only 14 miles from our camp! However, we were still exhausted from the climb to Whitney the previous day and simply couldn’t do another 3,000+ foot vertical day. 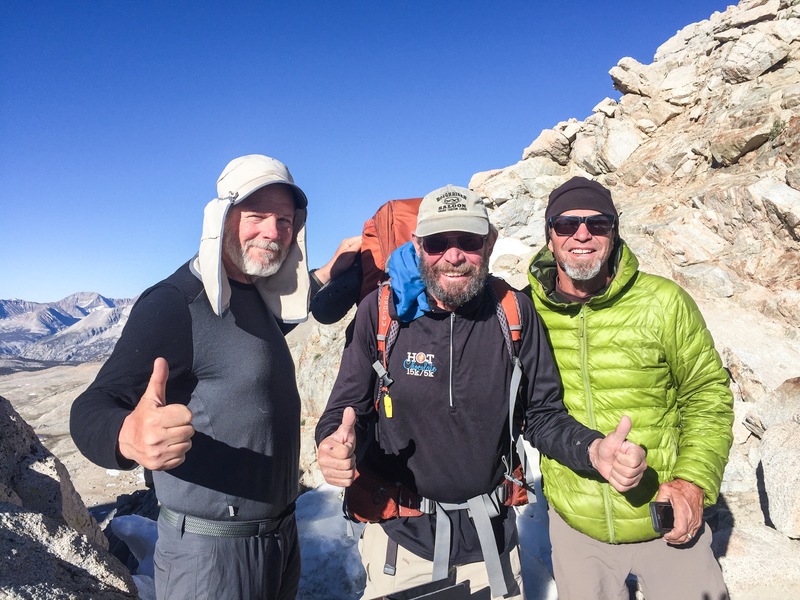 So we hiked 12 miles to the base of the pass and will summit on Tuesday morning. The day was made more interesting because we had to ford three streams! Up to now the creeks I’ve crossed were shallow with rocks to hop. Not these snow fed streams; you have to wade across. In normal snow years, some of these are too dangerous to cross in the afternoon peak; You have to wait till early morning when the snow is hard and the water is as much as 2 feet lower. But not this year! I crossed all three wearing my flip-flops. These are the nice ones with 1″ thick bottoms and an arch that I purchased in Idawild. I love these. We gained another member: Carol (Rocky), simi-retired physical therapist from Weed, CA. She’s our age. Right now I’m in my tent at 12,500ft. The sun went down and the temperature dropped 15 deg. The lake has ice on it, but the water from the stream is delicious! Bottled water should taste so good. The four of us started at 6:30am. We had to climb 1,000 ft in 0.8 mile. It was tough, but over quickly. Then we had the long 8 mile descent down the north side. There was a lot of ice and some snow early on the north side which made the descent slow, but that gave way to wonderful high meadows with trees and many creeks. 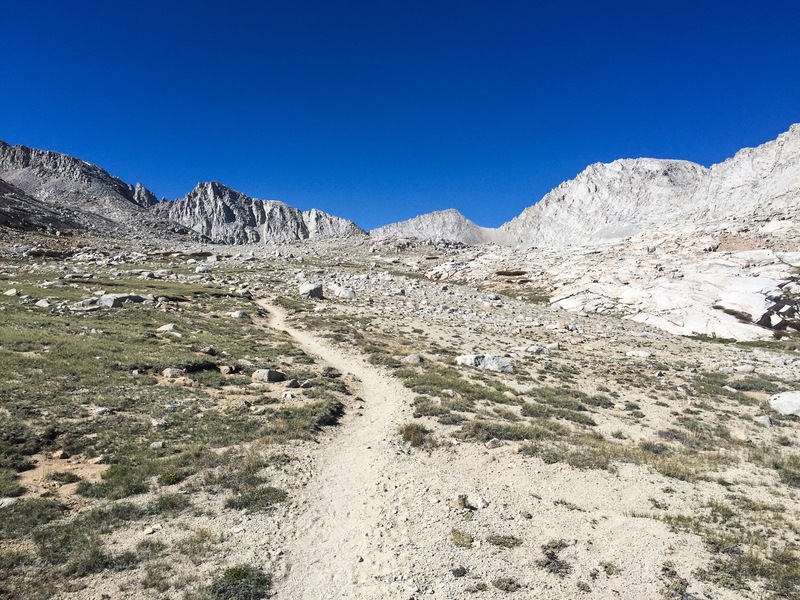 The goal the today is to get close the the Kearsarge Pass and Onion Valley. We found a nice campsite overlooking Bullfrog Lake and only 2.5 miles from the pass. We only did 12 miles today, but they were tough ones. 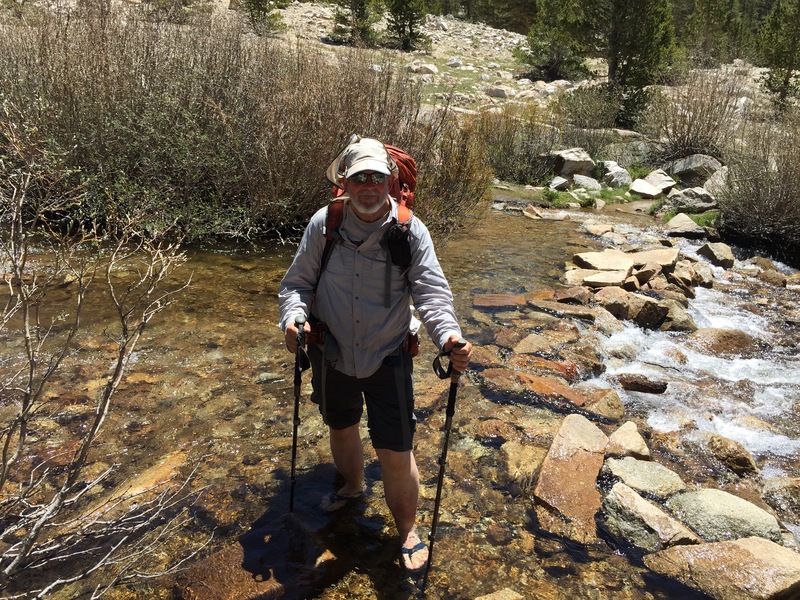 Wednesday we will hike the 7 miles to Onion Valley then hitch to Bishop for resupply. We are staying two nights in the tiny town of Independence (not even a Market here) and will take the bus to Bishop on Thursday to resupply and visit some outfitters. Also I will mail home my winter gear (Micro spikes and other stuff) to lighten the pack!!! Side story: We first tried two motels, and both were booked! One, the Mt. Williamson Motel was so nice that they gave us a free beer even though they were booked. Awesome service, and I wish I could have stayed there. Great people. Pictures! Here I am fording a stream. It was almost up to my knees in the middle, but low current. 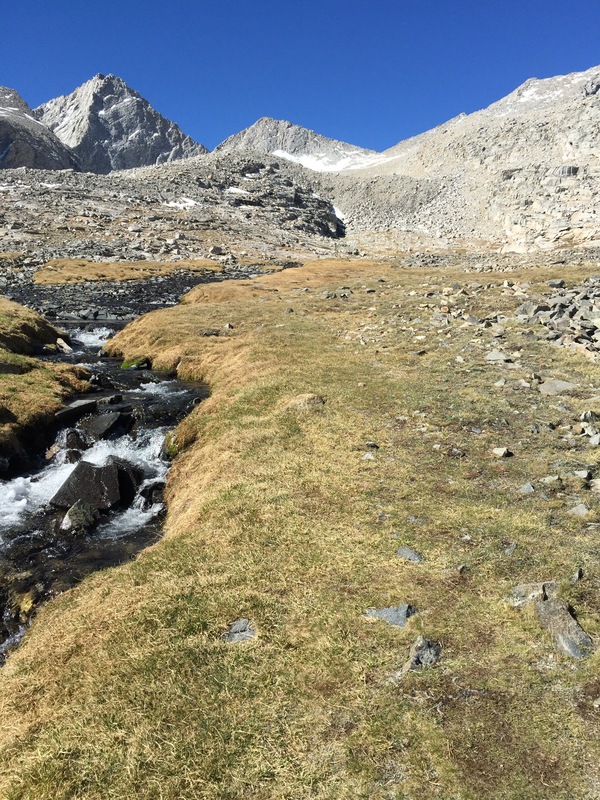 Here is the approach to Forrester Pass. The pass is the lazy “V” in the middle. Here we three are at the top! Here is another view of Forester Pass from the other (north) side. It is the “V” on the right. Lots of ice here. It was a difficult descent. Oh Mike: Your pictures are out of this world … of course, one has to have the constitution to get “almost out of this world” to get such sights on camera. Thoroughly enjoy hearing of your adventure!! Michael, you’re the man! Great communication and updates along your way. Keep it up.